The standard enemy encountered throughout most of the game. Iggy’s Mansion had quite a few butlers. And all of them seem to come from the same family, as they all look the same. Although, I didn’t want this to be the case, as I had designed two extra versions of the Butler Zombie for the sake of variety. But those two versions were eventually scrapped in favour of “the green one”. You can check out the other two versions down below. 16 Swans and I really love the way this character looks in the way. 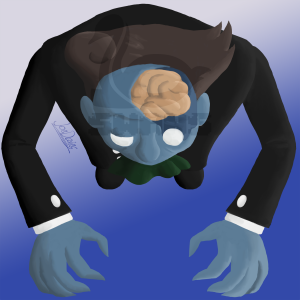 Like a classic Goomba or Badnik, this Butler Zombie has an iconic look to him, that i think people would recognise if we were to use him again in a possible future sequel.